Rapid development of fast-charging technologies for electric vehicles will lead to the installation of 199,000 fast-charging stations worldwide by the end of the decade -- more than 100 times the number of the stations in 2012, a study by IHS Automotive says. The number of the stations worldwide is expected to rise to 5,900 this year and to 15,200 in 2014, the study released Tuesday said. Fast-charging stations offer a high-voltage DC charge, and can charge a vehicle in as little as 20 minutes. "The length of time it takes to recharge an EV continues to be one of the major stumbling blocks inhibiting the widespread adoption of electric vehicles," Alastair Hayfield, associate research director at IHS Automotive, said in a statement. "Compared to the time it takes to refuel an internal combustion engine vehicle, the recharge time for EVs is incredibly slow -- at about four hours to charge a 24 kilowatt-hour capacity battery using a 6.6 kW on-board charger." Hayfield said if EV makers could overcome this obstacle, "it could lead to a high rate of adoption from environmentally minded consumers as well as those seeking to cut gasoline expenses." IHS forecasts that there will be about 800 fast-charging stations in the United States by year end. 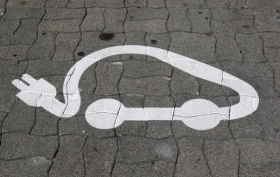 Automakers are converging around three emerging fast-charging standards. One design, dubbed CHAdeMO, is backed mainly by Japanese companies. Tesla has its own Supercharger system, while many American and German automakers support the Combined Charging System, or Combo.